The Children's Place is North America's largest kids' specialty retailer and fashion authority for children's apparel, shoes and accessories in sizes newborn to 16. From the cutest styles for babies to modern, head-to-toe outfits for big kids, find everything they want to wear for school, special occasions or everyday play (at prices you'll love!). Find the coolest designs for every occasion or just because, available in stores or online 24/7 at childrensplace.com! Use of this card constitutes acceptance of the following terms and conditions: Can be used for purchases of merchandise at THE CHILDREN’S PLACE stores, outlets or online at childrensplace.com. Redeemable in US only. Not redeemable for cash unless required by law and cannot be replaced if lost, stolen or used without your permission. Return of merchandise purchased with this card is subject to return policy. 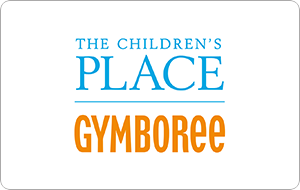 For balance inquiries, call 1-800-501-3232 or visit us at childrensplace.com/giftcardbalance.